I spent my first four Christmases in Germany, so I don’t remember them, but I’m sure they were happy ones for my parents. Having survived a horrific war, my father and mother, like thousands of other Poles, had found themselves in Germany. There they met, married and, in 1947, welcomed me into a new world. On Christmas Day, 1950, we were in Hamburg, waiting to board the ship that would take us to America. My only memento of that time is a black-and-white photo of my mother and me standing by a Christmas tree. I’m holding a little toy trumpet. Our next Christmas, and every Christmas after that, was spent in Detroit, where soon our family was blessed with two girls. My sisters and I were raised in a Polish home, speaking Polish and observing Polish customs, among them, of course, the wonderful Wigilia and Christmas traditions of the Poland our parents had been taken from, and to which they could not return. I have been fortunate in many ways throughout my life, not least by being with my family every Christmas. Every Christmas, that is, except one. In December, 1970, I was a young infantry officer in Vietnam. I had arrived in October at the huge American military base in Chu Lai, which stretched along the white beach of the South China Sea, and by early November I was leading an infantry platoon in the hilly jungles west of the base. During my first combat operation my friend and fellow officer, Mike Petrashune, was wounded not far from where I was. I had trained with Mike, a Polish American kid from New York, at Fort Benning, Georgia. Several days after he was wounded, shortly before Christmas, Mike died in the base hospital. His family and I still exchange Christmas cards every year. That Christmas the Communist Viet Cong and the Allied forces fighting in South Vietnam agreed to an informal one-day truce that, to a large extent, both sides honored. The American units in our area of operations were ordered to refrain from offensive actions on Christmas Day, except in self-defense. On the night of December 24 our company’s three rifle platoons, including my 1st Platoon, received orders to move to the hilltop where the company command post, or CP, was located. We moved out at dawn of Christmas Day and by early morning the whole company, around 100 soldiers, including the company headquarters and the mortar crew, was assembled on the hill. Around noon, a “Huey” helicopter arrived. Barely touching down, the chopper crew passed down big thermos-like containers loaded with a hot (or at least lukewarm) Christmas dinner of turkey, stuffing and potatoes along with cranberries and cans of warm soda. As soon as the chopper left, the sergeants set up a chow line for the soldiers. 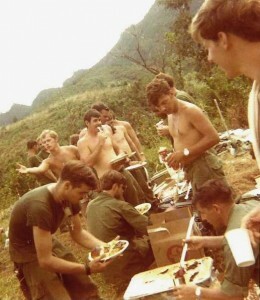 The day was hot and there was little shade on the hill, but that was a welcome change from the miserable, rainy weather of the previous weeks, and many of the soldiers removed their shirts as they moved through the line and then found a spot to enjoy the unexpected meal. The soldiers ate first, then their sergeants. The officers, of course, ate last. When some of the men had eaten, they grabbed their weapons and moved down the hill, freeing their buddies on the perimeter to go up and eat. Someone in Chu Lai had been thoughtful enough to send out two paper bells, one red, the other green. Those bells and some snow-like laundry detergent were our Christmas decoration that day. Back at the base, home to more than 15,000 personnel, many soldiers were able to participate in Christmas services. On our hilltop, perhaps 15 or 20 miles out, that wasn’t an option. But the war had paused only for a few hours, and as most of the soldiers relaxed and thought about Christmas back home, a small observation helicopter landed at the CP. I climbed aboard and flew out to reconnoiter the area my platoon would be patrolling during the next few days. The chopper returned me to the CP and repeated the process with the other two platoon leaders. That night, as silently as possible, my men and I helped each other to shoulder our 90-pound rucksacks. Then, slowly, we moved out, down the hill, back into the unforgiving jungle. But on that day, if only in spirit, I was with my family as it celebrated a Polish Christmas back in Detroit. My prayers were with them as theirs were with me, and to this day I am certain that for my parents, who had known war, and for my young sisters, that Wigilia and Christmas were much harder to bear than they were for me. Every Christmas since then I think of all the young men and women who, through many wars, spent Christmas thousands of miles from home.